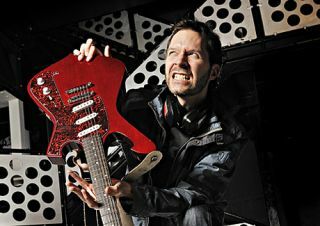 Guitarist was ultra-lucky to meet up with Mr Big guitar God Paul Gilbert during the band's recent tour of Blighty, and he was gracious enough to show us his new rig, that included the new Ibanez Fireman, a couple of Marshall half-stacks and a string of stompboxes. We filmed the entire thing, and the December issue of Guitarist features the entire On The Road With Paul Gilbert video. It's on both the final instalment of the Guitarist CD and our new service Guitarist Vault. The December 2011 issue of Guitarist is on-sale 23 November. Do not miss it.